Three easy, homemade face masks made with powerful manuka honey! 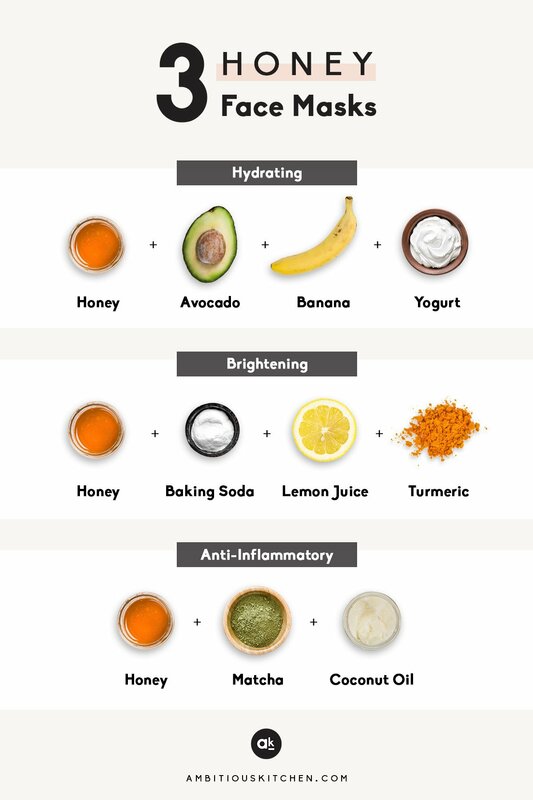 These DIY honey face masks are perfect for hydrating, brightening, or getting a boost of antioxidants. Over the years I’ve become slightly obsessed with face masks. They’re by far my favorite thing to treat myself with when I stop by the Whole Foods beauty section (and kombucha, of course). A few months ago I read an article from Lily of Kale and Caramel about washing your face with honey. Not only was I intrigued, but I had also just been sent several jars of New Zealand manuka honey to try, which has now become my favorite honey on the planet. 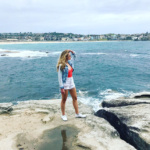 Yes, it’s a little more expensive, but also completely worth it because of the various ways you can apply it to your every day life. I eat a tablespoon before a workout for energy, put it in tea or my golden milk lattes, add it to smoothies and even use it for skin care. Manuka honey. This is the star of the show in each of these homemade face masks. Manuka honey is native to New Zealand and has been used in the natural health world for many years. Manuka honey contains an extraordinary enzyme called methylglyoxal (MGO), which helps give it a strong antibacterial and antiviral effect. This property is unique to Manuka honey and is not found in any other type of honey. We use is as the base of our 3 face masks here because it has excellent moisturizing and detoxifying benefits. 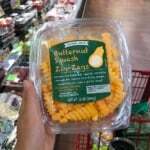 I typically use Comvita or Wedderspoon brands because they’re trustworthy. I believe that Trader Joe’s also carries a manuka honey. If you want to learn more about manuka honey and why it’s great for your skin, I highly recommend checking out this article from MindBodyGreen. Please note that these particular face masks don’t necessarily require that you use manuka, but if you have it available, I do recommend giving it a try. 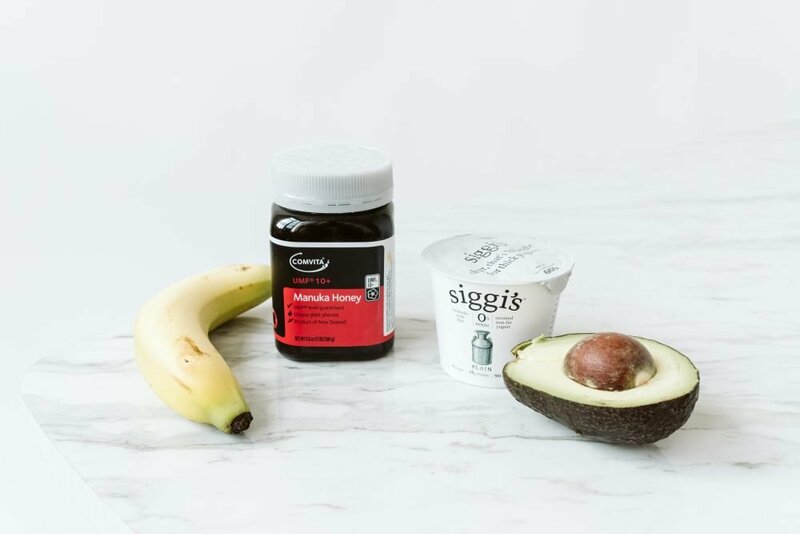 Hydrating mask: Add avocado, banana, honey and probiotic-packed yogurt together for a boost of hydration. The natural oils from the avocado help to moisturize any dry patches and leaves you with a nice, glowy complexion. Leave this mask on for 10-15 minutes. If you have extra, you can use it as a hair mask for your roots! 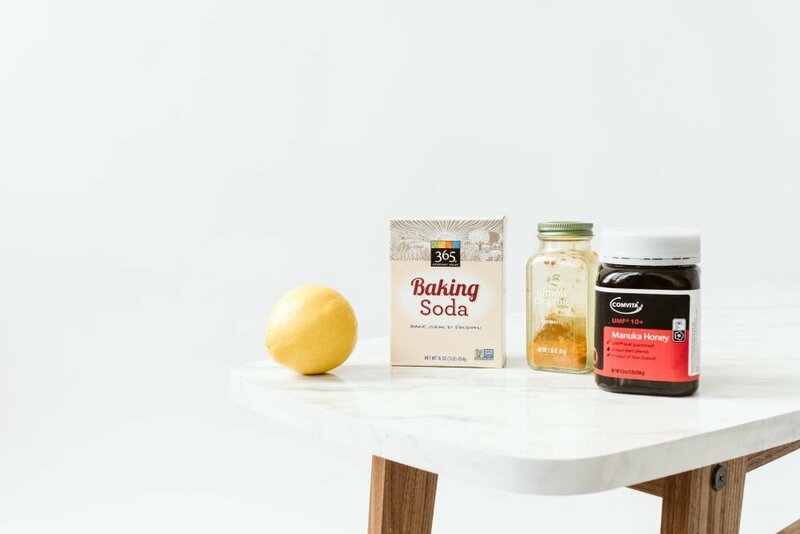 Brightening mask: the baking soda + lemon juice combination is great for clearing up blemishes and even extracting blackheads. Combine that with turmeric, which is used for treating acne, diminishing wrinkles, and even creating a nice exfoliant, and you’ve got yourself the ultimate skin-brightening combo. Be sure to keep it away from your eyebrows and don’t leave it on for more than 10 minutes. Afterwards I suggest wiping your face with a cloth you don’t mind getting a little turmeric stained. 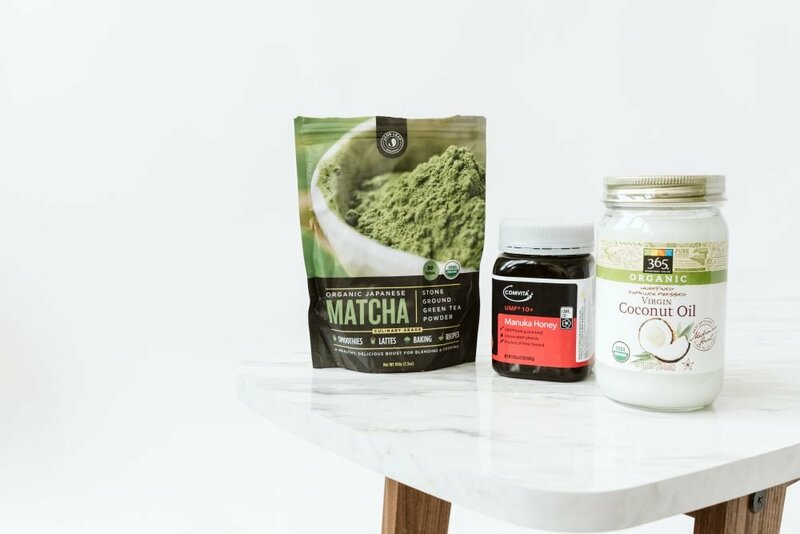 Anti-inflammatory mask: we used everyone’s favorite trendy coffee shop order – matcha. Matcha is a an antioxidant packed green tea that has tons of anti-inflammatory properties. This mask will give your skin a nice detox while hydrating with the manuka honey and coconut oil. Leave this mask on for 10-15 minutes before washing. 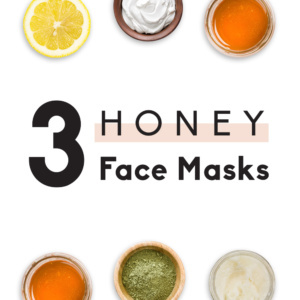 Call up your friends, get a fun girl’s night on the calendar, and make these three DIY honey face masks! They’re excellent paired with a glass of your fav rosé, just sayin’. For each mask, combine ingredients in a small bowl until smooth. Apply generously over entire face and leave mask on for 10-15 minutes before rinsing off completely with water. 20 Responses to "3 DIY Honey Face Masks + video"
Ooo I just love me a good face mask! 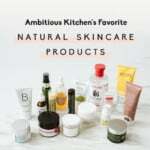 I love shopping in whole foods beauty aisle too and always end up leaving with one! I love how simple these are! So going to try the anti inflammatory one tonight! I also haven’t tried manuka honey yet but love raw honey in general. Gonna pick some up today! Same LOVE searching that aisle! These homemade ones are so much fun – manuka honey is the best. Enjoy!! SO EXCITED to try all of these face masks! Soft music, decadent candle, soothing face mask and a good read…I see this in my future v soon! I was planning on taking a bath this evening and I stumbled upon this, perfect! I am going try the brightening face mask as I have all the ingredients for that one :D. I hope I remember to avoid my eyebrows ha ha. How often should you do the brightening one? It really depends on the person! I personally use it about once a week or so – sometimes more, sometimes less depending on what else I’m using, the seasons, etc. Honey is a necessary material. Honey can moisturize your skin very well.